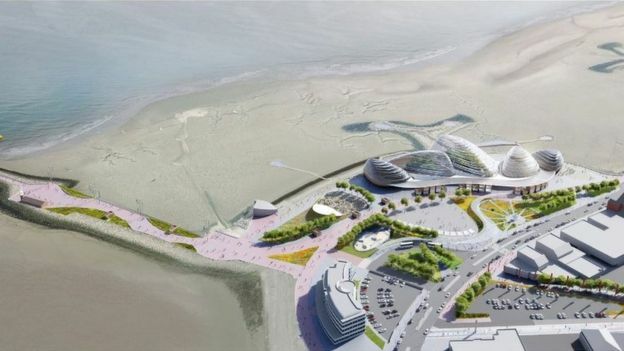 The Eden Project has offered a first look at its vision for Eden Project North which is planned to open in the Lancashire seaside resort of Morecambe. Images created by Grimshaw Architects show how the charity hope to install a series of pavilions inspired by mussels, which could house a variety of environments for people to explore. Those behind the scheme say the seafront location would offer picturesque views of the landscape, while visitors could take advantage of a large path right to the water's edge. Eden Project’s vision of a seaside resort for the twenty-first century includes reimagined lidos, gardens, performance spaces, immersive experiences and observatories. The area was formerly occupied by the Bubbles swimming pool and Dome theatre. The central aim of the proposal is to combine indoor and outdoor experiences, connecting people with the internationally-significant natural environment of Morecambe Bay while also enhancing well-being. Dave Harland, chief executive of the charity's international development company, said he was "extremely proud" of the vision for Eden Project North. “We aim to reimagine what a seaside destination can offer, with a world-class tourist attraction that is completely in tune with its natural surroundings,” he added. “Morecambe is a unique and beautiful location, perfectly situated near the Lake District and Yorkshire Dales. It’s so heartening to be working with partners who share our ambitions and aspirations for the town and region." The Morecambe project would be an extension of the visitor attraction in Cornwall which has contributed £2 billion to the local economy and welcomed more than 20 million visitors since it fully opened in 2001. The charity is looking for funding after completing a feasibility study in September. However, it did receive a boost last month when the chancellor Phillip Hammond announced the government would be backing the project and pledging £100,000 to the development.